A smooth 45 minutes from Halifax will get you within view of the Bay of Fundy, which boasts the highest tides in the world. From there, we follow the Evangeline Trail (scenic Harvest Highway), exiting at Greenwich for a stop at Noggin’s Corner Farm Market. Noggin’s is one of the oldest and largest apple producers in Canada and ships internationally under their own Bishop’s Favourite label, bearing the surname of the founding family, which still owns the farm. They also grow, sell and produce an extensive variety of other produce and products. We’ll continue to Canning, a picturesque village, where you’ll have the opportunity to eat at a wholesome café. From Canning we’ll drive along windy roads between fertile fields to Blomidon Provincial Park. A stunning beach, bordered by tremendous red cliffs with three waterfalls, highlights this park. The final stop will be The Lookoff, which offers the best view of the Annapolis Valley and is actually tough to describe. If desired, we can stop in Perreaux on the way home for ice cream. This is a half-day trip. Or make it a full day trip. After The Lookoff, for the hikers, why not continue another 10 minutes to Cape Split, a five-hour hike on a breathtaking trail of geological significance. A quick google image search will reveal these towns as typical Nova Scotian fishing villages. The friendly people and colourful homes make it easy to see why these towns are such a popular destination. A closer look will reveal calm wooden wharf that runs the length of the waterfront, many charming shops and delicious restaurants and café’s, many serving typical seafood dishes like lobster and chowder. As a half-day trip, we will stop in both towns, with a longer stay in Lunenburg. Everyone will have time to browse the shops, walk the waterfront and/or have a meal at a local restaurant. Peggy’s Cove, population 46, is probably the best known “seaside” destination. It features the classic red-and-white lighthouse, beautiful scenery and a well-known restaurant and gift shop. Tours to Peggy’s Cove usually take four hours, with two hours in Peggy’s Cove. A true Nova Scotia experience, this year-round destination offers the best maple experience, exhibiting a prime example of maple product production and consumption…mmmmmmm! Depending on the season they also offer sleigh rides, snow shoe rentals, a pancake house and log restaurant, sugar camp tours, sugar bush trails and much more. Please see their website for details. Visit their website at www.sugarmoon.ca. Consider combining this with a trip to Ski Wentworth, making it a full day trip, which is nearby. 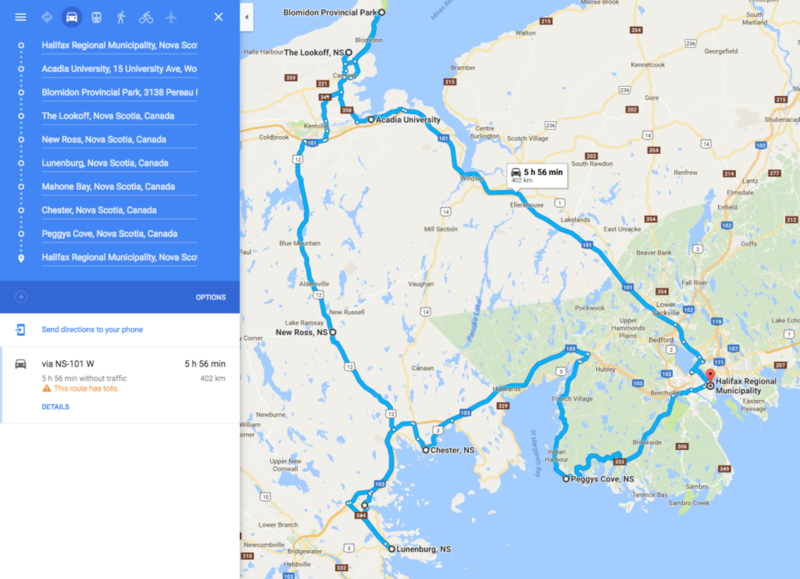 This is the ultimate tour of Nova Scotia. Get a feel for the North & South shores with this tour. This is a full-day trip. Our vans and chauffeurs are happy to take you wherever you wish, on a one-of-a-kind experience. Let us know where you’d like to go, and we’ll get you there! Choose Driver Dave’s for a unique, one-on-one touring experience. T rips to Lawrencetown / Rainbow Haven Beach. Crystal Crescent Beach is your typical Atlantic sandy beach with warm clear water. Custom trips to other beaches are possible. Martock is 600 feet high with seven trails including a terrain park and half pipe, 1 quad chairlift, two T-bar lifts and two rope tows. All downhill trails including the terrain park and half pipe are lit for night skiing and snowboarding enjoyment. Nordic skiing is available during daylight hours. Marble Mountain’s vertical drop is the highest in Atlantic Canada. Nearby Corner Brook is the snowiest city in Canada. And Newfoundlanders are known for being the friendliest people in the world. Do you want to learn to ski? The Marble Mountain Snow School offers daily lessons in skiing, snowboarding, and programs designed especially for kids. Marble Villa is Marble Mountain Resort’s condominium-style hotel and the only true ski-in / ski-out accommodation at Marble Mountain. Affordable and convenient, these slope side ski accommodations include kitchen facilities and beautiful views of the ski slopes and the Humber Valley. Getting here is easy with direct flights and affordable all-inclusive ski vacation packages including airfare, car rental, lift passes and slope side accommodations. And while we’re obviously biased to skiing and boarding, we must admit that other winter activities do in fact exist – and they’re loads of fun too! So we figured we’d take a look around this gorgeous area of ours and see what else you can get up to in the cold months. What we found was pretty astonishing! $420/single bed or $450/double bed per person – Based on minimum 6 person group – Marble Mountain Trip includes round trip transportation, round trip overnight ferry, two nights in a cabin, 3 days lift tickets.